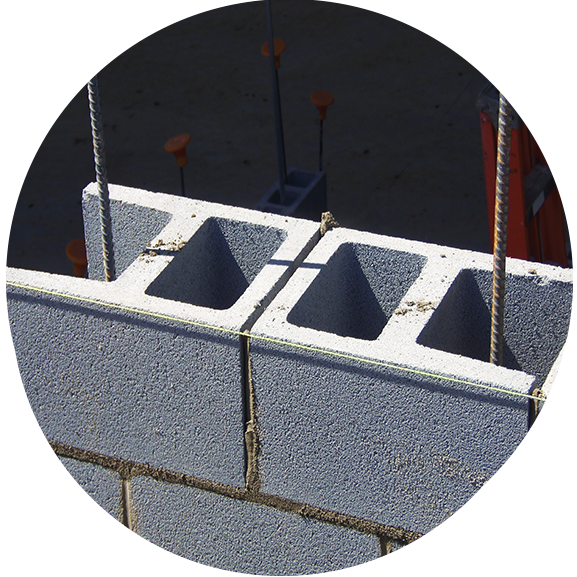 ProBlock set out to create a masonry product that would change the building industry. Our architect partners were top of mind when we designed our products. ProBlock Insulated Wall System offers architects an innovative masonry unit that helps deliver a beautiful project within schedule, under budget, and at the highest level of building performance possible. ProBlock helps you meet these goals and more. Whole-wall R-values for ProBlock walls are much greater than conventional 3-web concrete block walls. The increase achieved by injecting aminoplast foam insulation is up to 264% greater than is possible with normal weight concrete masonry walls injected with the same aminoplast foam insulation. R-value is the measure of thermal resistance used in the construction industry. Higher R-value equates to increased resistance to heat flow. R-value measures the ratio of the temperature difference across an insulator (concrete masonry wall) and the heat flux (heat transfer per unit area per unit time). The key to maximizing whole-wall R-values of concrete masonry walls is minimizing thermal bridges within the concrete masonry units and increasing the thermal resistance of the concrete used to produce concrete masonry units. Lightweight concrete is ideal for highest thermal performance concrete masonry wall assemblies. The table below illustrates the exceptional thermal performances that can be achieved by specifying ProBlock Masonry Wall System filled with aminoplast foam insulation. R-values of ProBlock walls insulated with aminoplast foam compare favorably to those insulated with closed-cell polyurethane foam. Because aminoplast foam flows within the wall, all of the nooks & crannies get filled. Polyurethane foam expands rather than flows; thus, many more holes must be drilled & patched, expanding foam tends to bridge small openings to leave voids, and polyurethane foam typically costs far more than aminoplast foam insulation. For these reasons – better performance and faster installation at a lower cost – aminoplast foam insulation @ R-4.60/inch is the better choice for injecting ProBlock walls vs. closed-cell polyurethane foam insulation @ R-5.91/inch. The table below illustrates how closely whole-wall R-values track one another no matter the type of foam used to fill core-cells of ProBlock walls.